My husband is very enthusiastic when it comes to shopping for food items. I really get inspired to cook a variety of dishes with all the different coloured fresh vegetables he purchases. 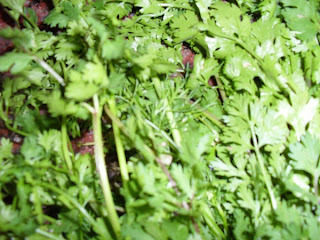 But to my greatest horror he keeps getting bundles and bundles of coriander every time he returns from shopping. Most of the time I have to discard the half used up, dry old bundle half heartedly when the new bundle arrives. God bless the kindly greengrocer who drops an extra bundle of coriander as kosru ( complementary ) in our shopping bag even in these days of sky rocketing prices ! 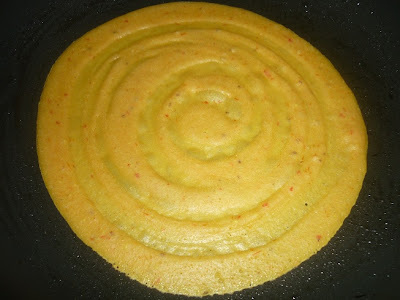 After tasting the store bought Kottamalli Tokku at my daughter's place I decided to prepare tokku at home using all the kottamalli ( coriander ) my husband buys from time to time. 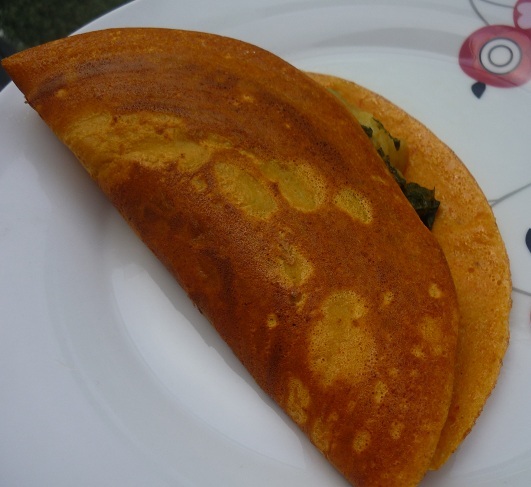 Now we have a constant supply of kottamalli tokku which we relish with every meal ! 1. 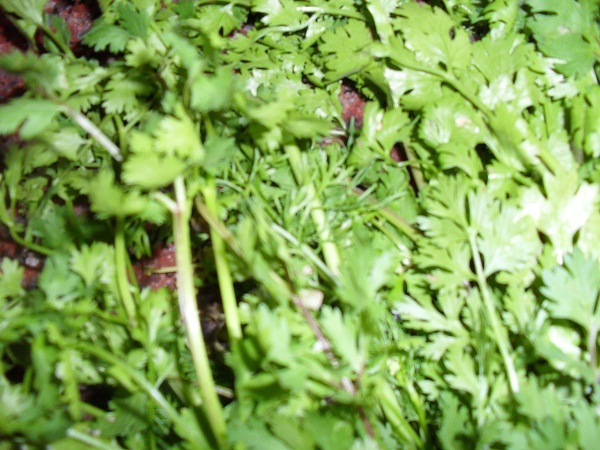 Remove the roots and wash the fresh coriander thoroughly before chopping. The stems can also be used as it is good fiber and it also adds to the body of the finished dish. 2. Dry roast fenugreek seeds till brown in colour and add the red chillies to it. 3. Roast till the chillies are crisp and the fenugreek seeds become dark brown in colour. 4. Heat 1/4 tsp of oil in a pan and add asafoetida followed by the chopped fresh coriander. 5. Saute till the leaves wilt. 6. When the coriander cools down grind it with the roasted fenugreek seeds and red chillies, salt, tamarind and jaggery into a smooth paste. Add the water used for soaking the tamarind while grinding. 7. Heat the remaining oil in the pan and add mustard seeds. 8. 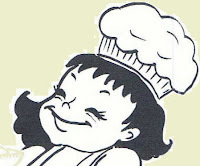 When the mustard seeds splutter add the ground paste. 9. Keep stirring and cook till the oil separates. Cool and store the Kottamalli Tokku in a clean dry bottle. 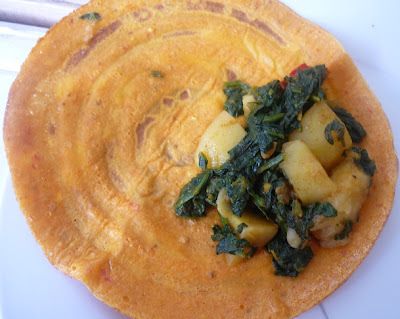 Enjoy it with hot rice and a dollop of ghee. Relish it with dosas or chapaties. Spread it on bread for a tongue tickling sandwich. This post goes to "Herbs and Flowers in my Platter" - Coriander leaves/Cilantro event in Krithi's Kitchen and here's the original event announcement in Seduce Your Taste Buds. 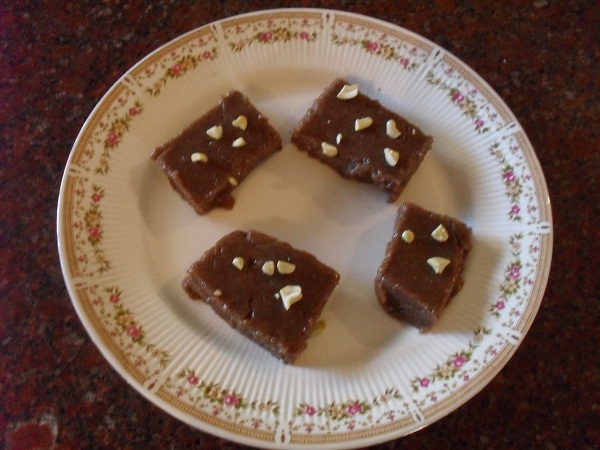 Halbai is an easy to prepare traditional sweet dish made out of ground rice, coconut milk and jaggery. 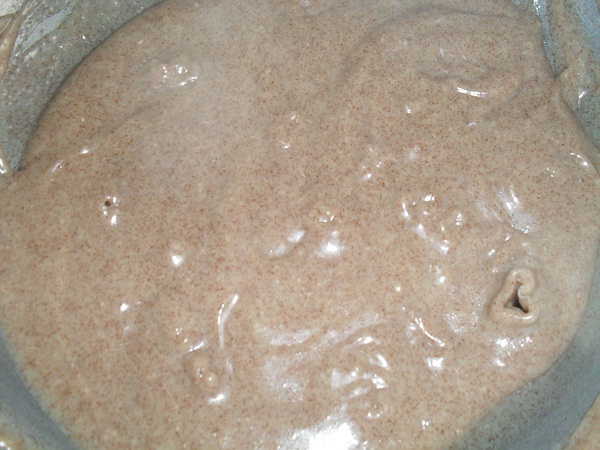 The 'milk' extracted out of soaked and ground wheat is another option to prepare mouth watering Wheat Halbai. Here is a healthier version of halbai prepared using ragi ( finger millet ). Ragi is soaked, ground and filtered to extract the 'milk' for preparing halbai, and the squeezed out husk is discarded. 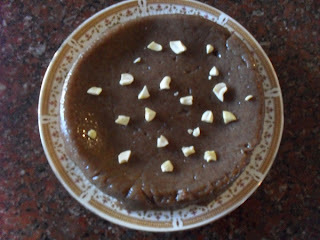 But I have used whole ragi flour to retain the healthy fiber content of the millet in this version of the sweet dish. Cashew nuts - a few. 1. Blend ragi flour with warm milk into a smooth paste and let it stand for fifteen minutes. 2. Dissolve jaggery in 2 cups of warm water and filter it. 3. Cook the ragi flour paste and jaggery water together in a heavy bottomed pan. 4. Keep stirring to avoid lumps. 5. 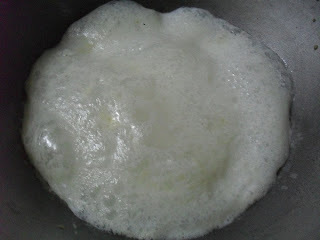 Add ghee little by little and keep stirring till the whole mass comes together. 6. When the halbai becomes dark and shiny and starts to leave the sides of the pan, add cardamom powder and the remaining ghee . 7. Pour it on a greased plate and garnish with cashew nuts. 8.Allow to set and then cut into desired shapes . 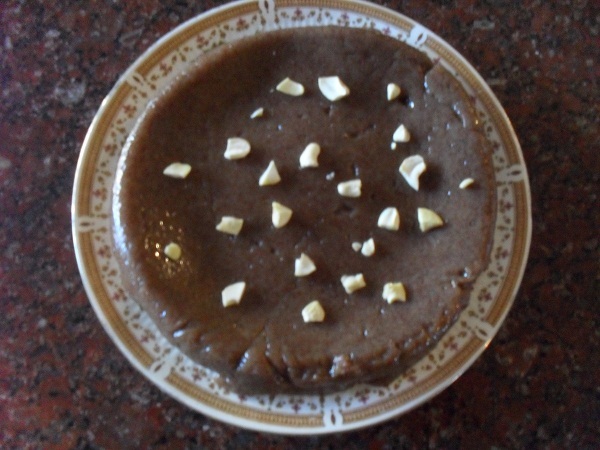 Relish the silky soft and nutritious Ragi Halbai while still warm. Aval payasam ( Tamil )/ Avalakki Payasa ( Kannada ) can be prepared in no time. The texture of Aval ( beaten Rice ) is such that it gets cooked very quickly. 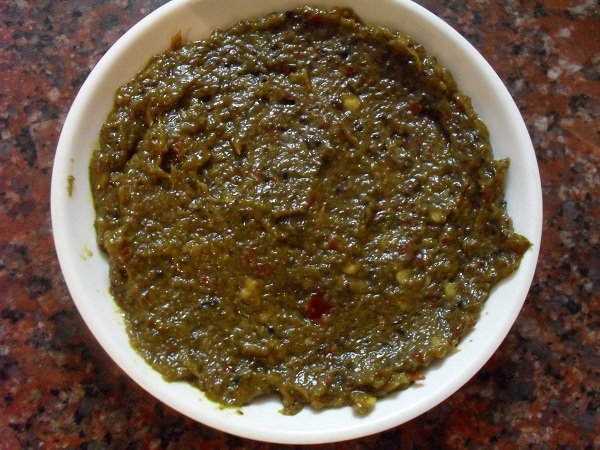 Soaked Aval when seasoned with spices and garnished with herbs makes a wholesome meal. 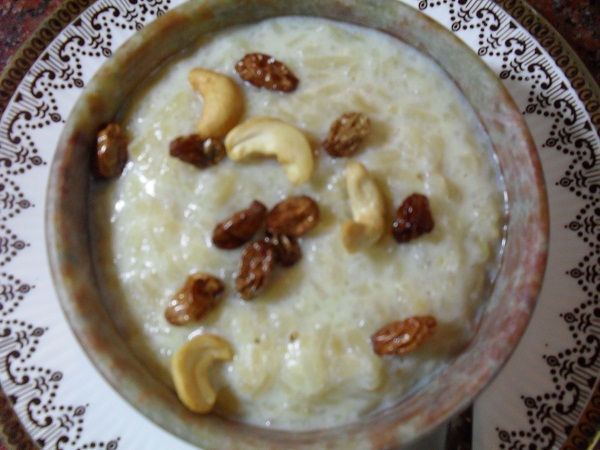 Like wise when Aval is combined with milk and sugar it becomes the yummy Aval Payasam which can be relished as a dessert even after a heavy meal. 1. 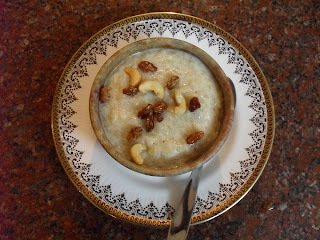 Heat 2 tsps of ghee in a pan and roast the cashew nuts and raisins and keep them aside. 2. Roast the Aval in the remaining ghee till it pops up and becomes reddish brown in colour. 3. Boil milk in a heavy bottomed vessel for five minutes till it becomes flavoursome. 4. Add the roasted Aval to the boiling milk and cook on medium flame till it becomes very soft. 5. Add sugar and cook for five more minutes, and then switch off flame. 6. Powder the cardamom and edible camphor together and mix into the Payasam. 7. 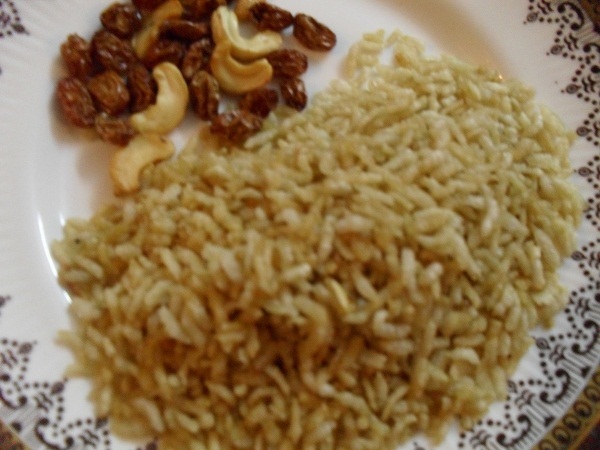 Garnish with roasted cashew nuts and raisins. Relish the sweet and creamy Aval Payasam either warm or chilled. This post goes to "Lets Celebrate Sweets- Warm Desserts" event hosted on Mharo Rajasthan Recipes blog. 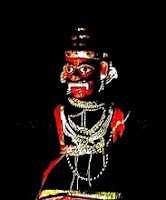 Here's the original event post on Nivedita's blog.